USABlueBook - Cover Slips for Microscope Slides, 22 mm, 1 oz. Now In: Lab Equipment / Microscopes & Accessories / Cover Slips for Microscope Slides, 22 mm, 1 oz. Cover Slips for Microscope Slides, 22 mm, 1 oz. These glass cover slips are manufactured to stringent thickness, flatness and surface error tolerances making it easy to see your sample under magnification. 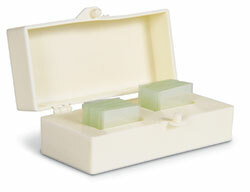 Pre-cleaned and conveniently packaged in one ounce plastic boxes for easy removal. Choose from 18 x 18 mm and 22 x 22 mm sizes. Both sizes are No. 1 thickness and measure 0.13 to 0.16 mm thick.